Showmonsters mod 1.6.2 and 1.5.1 includes new controls with which you can make your screen appear very useful information in order to spawn your mobs easier. It will reveal what mobs can spawn in your surroundings, taking into account the time of day. 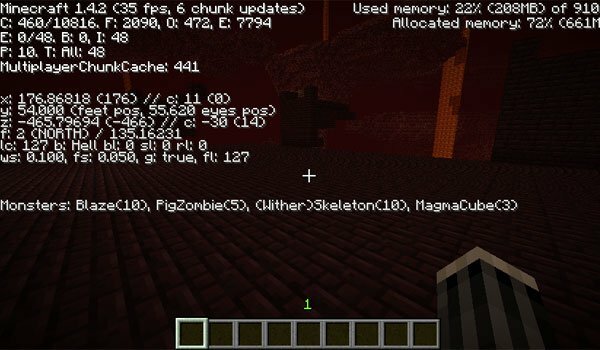 It can be very useful for finding the exact places where they can spawn certain mobs that are whimsical time to appear, such as the Wither Skeletons and witches. It can tell you which mobs can spawn on at exacly the point where you have your feet. Install the mod and hit “F4″ to activate the list of monsters and their probability. How to install ShowMonsters Mod for Minecraft 1.6.2? How to install ShowMonsters Mod for Minecraft 1.5.1? Find which mob to spawn, is now much easier!